Safety is a top concern in the aviation industry. Skilled aviation maintenance technicians ensure that today’s aircraft are in proper working order before they hit the skies. Professionals often possess a broad range of mechanical skills, including those focused on diagnostics and maintenance. While attending a certificate program is not required, it can accelerate your career when compared to seeking opportunities to learn solely on the job. Additionally, you will be eligible for certification more quickly by attending an approved program. Aircraft are complex machines and have strict requirements governing their proper maintenance and upkeep. Typical job duties include the diagnosis of mechanical and electrical issues, making physical repairs to components, such as the wings and brakes, replacing defective parts, reviewing proper maintenance procedures, testing parts and components, and records maintenance. You may choose to pursue a career as a generalist, allowing you to work on a variety of aircraft during the course of your career. Alternatively, you may wish to specialize in a particular style of aircraft. Certifications are also available in the areas of airframe and power plant mechanics. While both are not required to work in the field, having all available certifications can lead to more job opportunities. To work as a certified mechanic, it is wise to choose a program that is approved by the Federal Aviation Administration (FAA). That way, once you receive your certificate or degree, you will be automatically eligible for the correlating certification exams. Most educational institutions that offer aviation maintenance technology certificate programs have minimum requirements for all students pursuing the field. Traditionally, a high school diploma or its equivalent is required to be considered for placement, though you may apply before your official high school graduation. However, your admittance will be dependent on successful completion of your high school education. No additional training is usually required before the beginning of the course. To arrive better prepared for the classes ahead, you can use your time in high school to create a more solid foundation for your work in the field. Math skills is especially valuable in the profession and can make achieving certificate course requirements easier. Classes in physics and mechanics can also be useful. Science courses are also beneficial, as well as having a solid fundamental understanding of computer or equipment operation. Otherwise, being able to read and write in English is often necessary. If you have the opportunity to complete some on the job training related to the field of study, you may find classes are easier to manage. However, experience in the field is not a requirement for admission in the majority of programs. Due to the nature of the work, a high degree of accuracy is critical. This requires attention to detail and superior organizational skills to ensure that all required activities are completed in a timely fashion. To help with the mechanical aspects of the work, manual dexterity is vital as well as strong hand-eye coordination. Since maintaining accurate records is a critical part of the profession, having effective filing skills can be helpful. Computer skills are often required, as many records are kept in electronic formats. You will also need to be able to read and write in proper English to complete necessary forms or refer to aircraft manuals. Once you complete your high school diploma or its equivalent, you can begin planning your additional education. Class schedules will be set by the school you choose to attend. While daytime courses are standard, some educational institutions may have night and weekend classes available. This can be helpful if you need to arrange your education around other obligations. It is important to discover what scheduling options are available before pursuing your education at that particular college. That way, you can be reasonably sure you will be able to attend. If the school you select offers financial aid, you will need to complete additional documents and relating to your financial situation. For institutions that can accept federal financial aid, you will need to complete the Free Application for Federal Student Aid (FAFSA). The results of your FAFSA will determine the government programs for which you may qualify, such as Pell Grants and federal student loans. Schools may also offer their own financial aid programs separate from those available based on your FAFSA results. This can include various payment plans as well as institutional scholarships. Further, you may be able to pursue private student loans to cover any additional costs of tuition. However, this is dependent on your eligibility and the educational institution’s willingness to accept this form of payment. When financial aid is not available, you need to be ready to pay for your courses in full. Each school will have specific deadlines and standards regarding timely payment. Once you have been admitted to an aviation maintenance technology program, you will need to attend classes to earn your certificate or degree. Coursework will cover a variety of skills and knowledge areas to ensure competency in the subjects that are most applicable to working in the field. Classes are traditionally available during the day, but many educational institutions also offer evening courses. This gives students the flexibility to choose a schedule that works around their other obligations, such as current employment or personal needs. It is important to find a school that offers classes during times in which you feel confident you can attend. Due to the hands-on nature of the work and training, excessive absences may result in failing the course or being dropped from the program. Most educational institutions have a particular order in which the classes must be completed. This helps students by building on their previous experiences during higher level courses. Some programs are completely set by the institution, meaning that the members of a class will often progress from beginning to end as a unit. Others may have some variances that allow for a customized approach. The amount of time required to complete aviation maintenance technology program may vary based on the college you choose to attend. However, many schools offer certificate programs designed to be completed within one year. Other institutions may offer programs that result in the student receiving an Associate of Applied Science degree, which may take closer to two years. In some cases, using only an evening class schedule may extend the amount of time required to complete the program. If that is the case, the school will be able to review this information with you. Programs will often include a mix of classroom-style learning with practical instruction. This ensures you have a full understanding regarding the required job duties as well as experience actually performing these tasks. 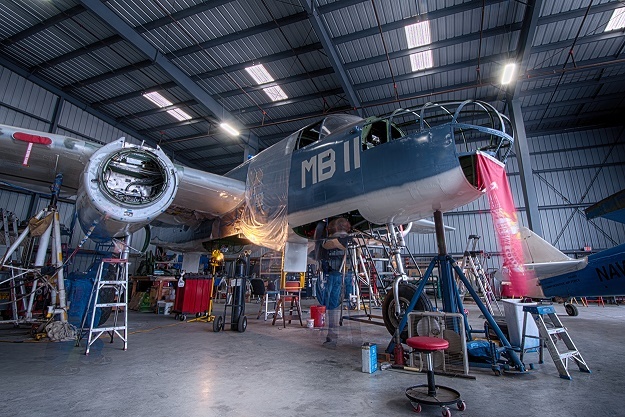 Classes cover a range of topics including electrical systems, landing gear, hydraulics, engines, and propellers. Coursework will review proper installation and repair techniques for all relevant systems. Longer programs may include the opportunity to learn additional related skills such as welding. Those who choose a program that results in an Associate’s degree will also be required to complete certain core educational requirements. This can include lower-level math, science, and English courses. The exact requirements for completing the program may vary slightly depending on the school you attend. Certifications regarding aircraft maintenance are set by the FAA. To become a certified aircraft mechanic, you are required to complete oral and written tests, as well as practical exams. Tests can take up to eight hours and are focused on specific areas, such as airframe or power plant. To be eligible for the exam, you must complete an appropriate, FAA-approved, educational program covering the information that will be included in the test. Upon graduation from an approved program, you are considered eligible for the examination. To receive your certificate, all three sections must be successfully completed within a 24-month period. If you fail a portion, you can retake the test after waiting a minimum of 30 days or after the completion of additional relevant training pertaining to the topics that you did not pass. Once you become certified, you will need to complete certain activities to preserve your certification. Often, these requirements can be met by completing relevant repairs or other forms of maintenance on aircraft during the completion of your job duties. Additionally, you will need to acquire continuing education credits offered by your employer, an aircraft manufacturer, or through an approved educational program. These classes help ensure that you are apprised of the latest technology and any changes in standard procedures. It also exposes you to any changes in associated laws or regulations of relevance. The need for qualified aviation maintenance technology professionals is expected to remain steady up through 2024. Even though more air travel is anticipated, technological advances regarding aircraft technology can lead to aircraft needing fewer repairs while still maintaining the highest level of safety. Competition for jobs within the field varies based on the precise position being pursued. Mechanics who hold certifications are better equipped to find opportunities than those working without any additional credentials. Most individuals working in the aviation maintenance technology field perform the majority of the job duties while in an aircraft hangar, designated repair station, or on an open airfield. This means that work is often completed in environments that lack notable temperature control, and may even result in being exposed to the elements while completing maintenance activities. Based on the physical nature of the job, injuries can be common. The work often requires heavy lifting and exposure to potentially dangerous chemicals. Exposure to loud noise is also considered a job hazard. Depending on the materials with which you are working, eye protection may be mandatory. Similar, masks may be used when being exposed to specific conditions, and ear protection is standard when working around significant noise. Those working in the field of aviation maintenance can see median annual salaries above $58,000, while those in the top 10 percent may earn over $87,000 per year. Pay can vary depending on the environment, with scheduled air transportation providing the highest median wages. It is common for those working in the field to be associated with a union, which may provide standard salary expectations over the long-term. Most full-time positions come with a benefits package. Available insurance often includes medical, dental, vision, prescription, and life. Retirement plans are often included, as well as paid time off. Some employers may offer educational benefits to assist with any continuing education pertinent to your certification and/or the performance of your job duties. While limited growth is expected in the field, you can progress in your career as you gain additional certifications and experience. Most repair facilities have supervisors working alongside other mechanics. Those with management duties often receive higher wages than those working as individual contributors.